I had some errands to run in the Bangor Mall area this afternoon on the way to work. I'm glad I got them done before these clouds showed up! Thunder was cracking and rumbling (all too closely) as I snapped shot number three above. I managed to climb back into the car just a few moments before the rain started coming down in buckets. 2008 Northeast Regional Gymnastics Meet in Waterville, Maine. Submitted to Moody Monday's Competitive challenge. I'd love to have had a better vantage point and/or shoot against a better background for this, but there was no room to maneuver in the gym. Pointing towards (or away from?) Macro Day's challenge. Stairs anyone? We had the good fortune recently to be able to play the Belgrade Lakes Golf Course. The bad fortune for the day was that we got rained on a couple of times while we were playing the front nine. The timing, though, was pretty good as we'd just finished the front nine when the thunder and lightning portion of that day's weather decided to arrive. We hung out in the clubhouse for a bit rather than get completely drenched by standing outside for a few seconds. Now we'll have to go back so we can play the back nine. The view was kinda cool for a rainy/cloudy day, but it would be nice to be able to go on a clear day and take in the entire view. Not a bad place to work, I imagine! 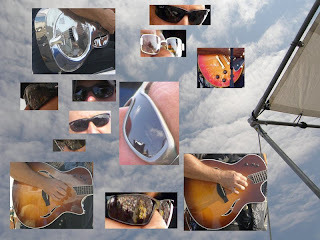 More photos from the 2008 North Atlantic Blues Festival can be found on Whittling Fog on flickr. In addition to the photo collage above (where a couple of those mirror shots were even intentional!) 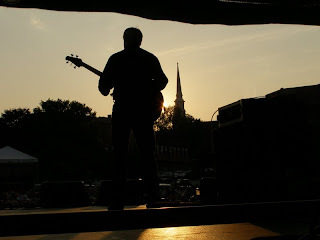 I've got a few reflections on the 2008 North Atlantic Blues Festival. My experience at this year's festival was excellent (it usually is as this is a great festival)! Saturday also saw Sugar Blue (Harmonica - Harlem, New York) and Ruthie Foster (acoustic guitar- Austin, Texas) perform. Two of the highlights of the weekend, for me, were Sugar Blue's rendition of Sonny Boy Williamson's anti-war song "Another Man Done Gone" and Ruthie's rendition of the traditional tune "Death Came a Knockin' (Travelin' Shoes)". Ruthie's entire set, though, was a highlight. She just seems to completely occupy whatever space she plays, whether it's a cozy theater in front of 200 people or the big stage in Rockland in front of 8,000. Ruthie's performed quite often in Maine over the past four years. We've managed to see her twice in smaller rooms - once at the Neighborhood House in Northeast Harbor for an Austin/Acadia connection show and once in Unity at the Unity Centre for the Performing Arts, so WE knew we were in for a treat! As Paul Benjamin told me on Saturday, Sunday's performers would have a little something for just about anyone's taste in blues. The morning started with soulful singer Chick Rodgers (Chicago - she has a new album out on Koko Taylor's label), followed by an effervescent Wayne Baker Brooks (guitar - Chicago - son of Lonnie Brooks and brother of Ronnie Baker Brooks), the sultry/soulful, funky blues and R&B of Janiva Magness (Originally from Detroit - another performer with a personal history worthy of many blues songs), the West Coast Swing (and many other styles he's absorbed in a 40+ year career) of Rod Piazza and the Mighty Flyers, and Elvin Bishop (formerly of The Paul Butterfield Blues Band - one of those 60's bands that inspired so many people to pick up a guitar or harmonica) put the FUN in funky to cap things off. It's hard to pick a highlight from Sunday because everybody was good and very different from the previous performer. If pressed, I might have to say that Bishop's more bluesy, lightly funky treatment of "Fooled Around and Fell in Love" worked really well for me. I should also mention that Roger "Hurricane" Wilson played in between sets both Saturday and Sunday. His vast repertoire lent itself well to playing between sets beside the stage and probably getting more total performance time than any one of the main stage acts. I've always like Roger's recorded version of the Reverend Gary Davis song "Death Don't Have No Mercy". His live rendition of the song was another highlight of the weekend. 2008 North Atlantic Blues Festival in Rockland, Maine. More to come (both here and on flickr). Guest photography (I'm pretty sure it's just the Trout shot) by Jenny Why_me. Submitted to Unique's challenge for Lunar Moon. This playful dog got loose briefly at Popham Beach. He didn't seem inclined to just run off, but he had a lot of fun teasing his humans by playing a game of "Catch Me If You Can". They eventually did, but, well... you can see what happened when dog, muddy sand, ocean and human got together.